1. Pin-bone the mackerel fillets: remove the line of bones down the centre of the fillets with tweezers. 2. Mix together the rock salt, sugar, coriander and cumin seeds and ginger, and spread half the mixture on a tray. Place the mackerel fillets on top, then cover with the remainder of the salt mixture. 3. Leave for 5 minutes, then remove the mackerel fillets, rinse thoroughly under cold running water and dry with a clean tea towel. Cut into 1cm dice. 4. Mix the flours and lemon juice together in a bowl, then beat in enough water to thicken the mixture so that it coats the back of a spoon. Season with salt. 5. Add the masala spice mix, chilli, diced cooked potato, chopped coriander and diced mackerel. 6. Heat 2cm of vegetable oil in a deep frying pan over a medium heat, or use a deep fat fryer. Drop tablespoonfuls of the mixture into the hot oil and fry for 3–4 minutes until golden. 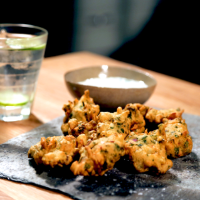 Serve the pakoras warm with the minted yogurt. 1. Put all the spices into a food processor, breaking up the cinnamon stick, and whizz for about 1 minute until nicely broken up. 2. Using a coffee grinder, grind 2 tablespoons of the mixture at a time for 10 seconds, ensuring that the grinder doesn’t get too hot. 3. Pass the spice mix through a fine sieve with a ladle and store in a Kilner jar or other airtight jar.